Model: The locomotive has a digital decoder and extensive sound functions. 2 controlled high-efficiency propulsion systems with flywheels, 1 motor for each powered truck. 3 axles and jackshaft powered in each powered truck. Traction tires. The locomotive frame is articulated to enable the locomotive to negotiate sharp curves. The triple headlights are built into the brakeman's platforms with a closed sheet metal housing. The triple headlights and 1 white marker light (Swiss headlight / marker light code) change over with the direction of travel, will work in conventional operation, and can be controlled digitally. When the locomotive is running "light" the lighting can be changed to 1 red marker light. The headlights at Locomotive Ends 2 and 1 can be turned off separately in digital operation. When the headlights are off at both ends, the double "A" lights are on at both ends. Maintenance-free warm white and red LEDs are used for the lighting. The pantograph can be raised and lowered as a separate digital function. There is a Telex coupler at each end of the locomotive and each coupler can be controlled separately in digital operation. 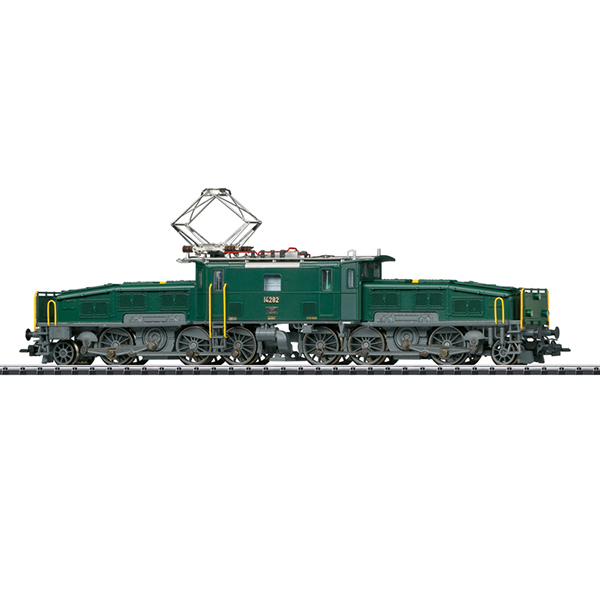 The locomotive has highly detailed metal construction with many separately applied details. The oil cooler housing is located between the two groups of driving wheels. The locomotive body comes in 3 parts with hoods that swing out separately. The roof equipment is detailed with safety grills beneath the pantographs. A figure of a brakeman for the brakeman's platform is included. Length over the buffers 22.3 cm / 8-3/4".